Art is nothing less in its fundamental truth than the aspect of beauty of the Divine manifestation. If you want art to be the true and highest art, it must be the expression of a divine world brought down into this material world. In a sense spirituality is the highest art, the art of life; for it aims at creating a life of beauty pure in line, faultless in rhythm, replete with strength, illumined with light and vibrant with delight. Living only to express beauty. 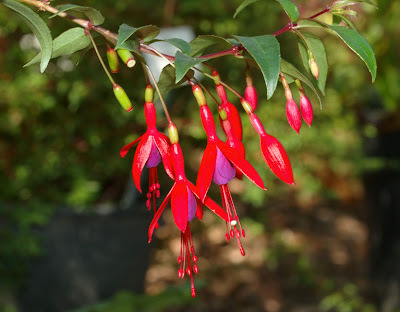 Small to medium-sized pendulous flower that resembles a lantern or a ballerina's skirt, with four usually recurved and colourful sepals that spread above four tightly overlapping rounded petals and prominent exserted stamens; in white and shades of pink, red and purple, often bicoloured and double; borne singly from the leaf axils or in terminal racemes or panicles. A small shrub to small tree. Is pleased with beautiful things and is itself beautiful. 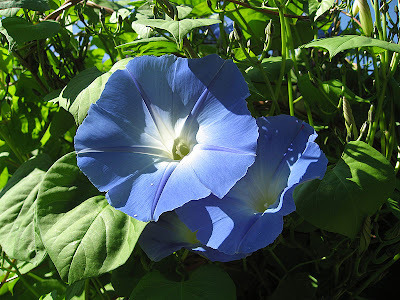 Large showy intense blue funnelform flower with a pinkish purple star at the centre and a lavender pink tube becoming white at the base; borne singly or in few-flowered clusters. A robust perennial vine. A powerful aid in fighting ugliness. Large blue funnelform flower with a white throat; borne singly or in few-flowered clusters. An annual climber. Neglects nothing in its search for perfection. 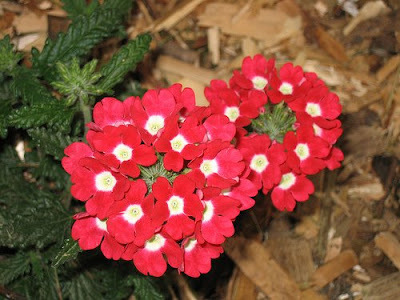 Small soft red with cream centre salverform flowers with irregular rounded lobes; borne in flat- topped terminal spikes. A creeping matlike perennial often grown as an annual; the sagittate pubescent leaves have crenate margins. Work at the service of beauty. 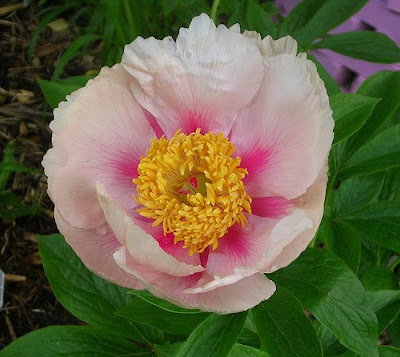 Small very light pink salverform flowers with indented petals; with a narrow tube and a flattened limb divided into five broad slightly overlapping lobes; borne in dense terminal clusters. A long-flowering garden annual. It blossoms in the Light and knows how to manifest it. 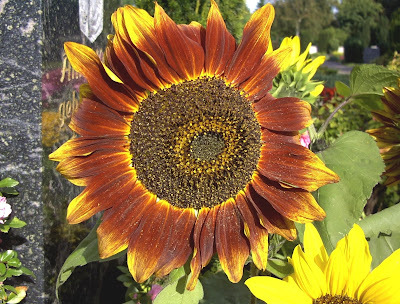 Large dark brownish red flower with a golden yellow glow at the tips and backs of the ray florets, and a dark brown central disc flecked with yellow; borne singly or in clusters. An annual or perennial herb.